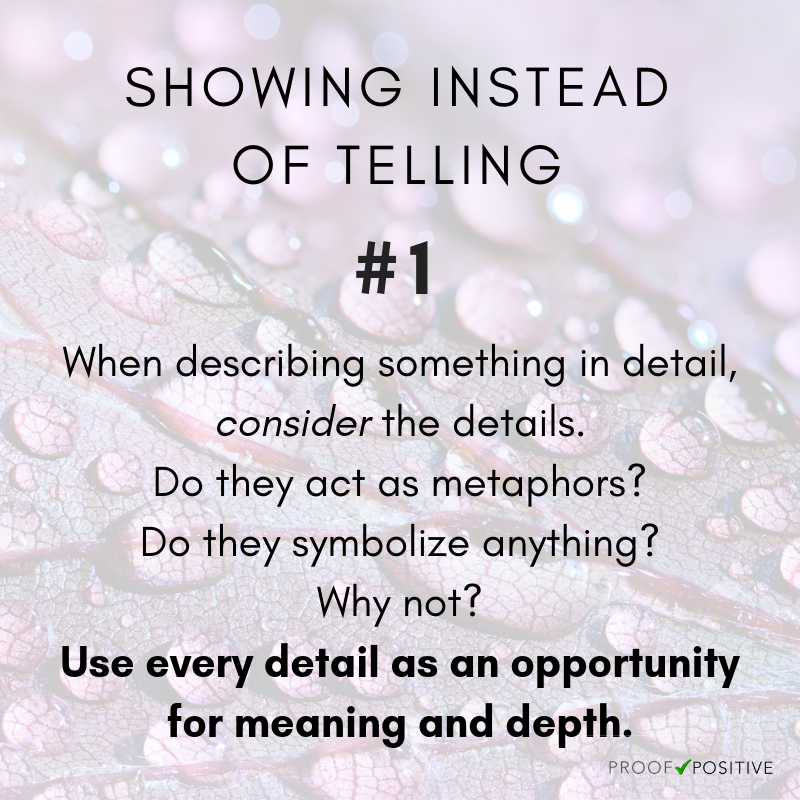 We’re excited to start a new series of posts that focus on one particular part of the writing process in deep detail—showing instead of telling. It’s an important part of writing that many authors know of but don’t totally understand. Even those who do understand what it truly means don’t always know how to wield its power to the greatest extent possible. There is always more to learn and use as a tool in your writing arsenal. This may sound overwhelming at first, but your work is worth the effort. When you describe something, every word should count—no excess words allowed. But why not make each word count for more? If you describe a chair, you can choose something that matches your character’s personality, underlying traits, or even general mood. The color of the house or its lighting could reflect the relationship of the family or people living in it. Even a weapon can be a metaphor for a character’s strength or personality. These orders don’t have to always symbolize the examples provided, but the idea is that the order can represent the person, their type of job, their personality, etc. Here’s one of the keys to using this piece of advice—and it’s a preview to one of our upcoming “show don’t tell” posts: after having a character sound indecisive in dialogue, for example, don’t point it out in narration. That’s showing and then going on to tell too, and not only is it unnecessary, but it ruins the effect. Try this out for yourself using the example below. 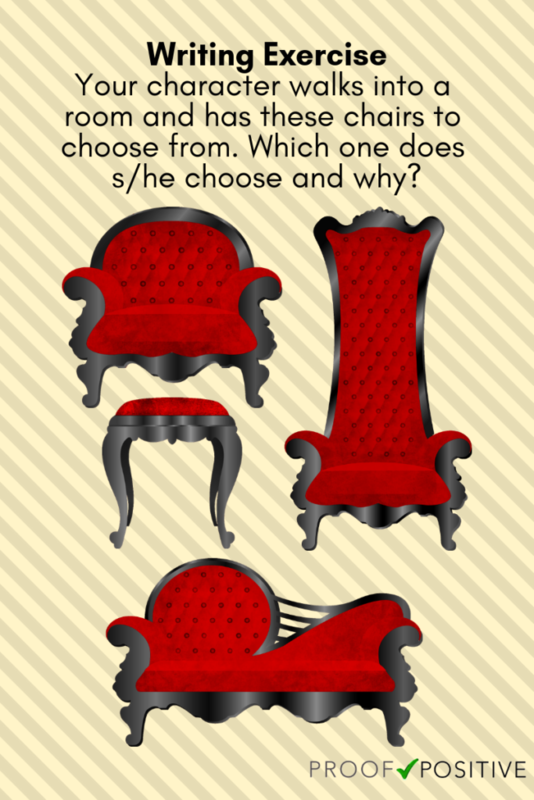 You can change the color of the chairs and even the style, but the point is to think about the scenario, the character, his/her personality, what s/he may be trying to prove or the impression s/he may be trying to create, etc. Write a scene and follow the instructions below. This entry was posted in Writing and tagged fiction writing advice, how to make every word count, how to show instead of tell, including symbolism in writing, integrating symbolism, novel writing advice, personality traits in characters, show don't tell, show don't tell how to, show don't tell writing, showing characters' personalities, writing exercise, writing fiction, writing metaphors, writing tips. Bookmark the permalink.